Bake the potatoes for about 50-60 minutes, or until soft. Carefully slice each potato in half lengthwise, and scoop the potato flesh into a bowl, leaving the skins intact. Put the skins on a baking sheet. 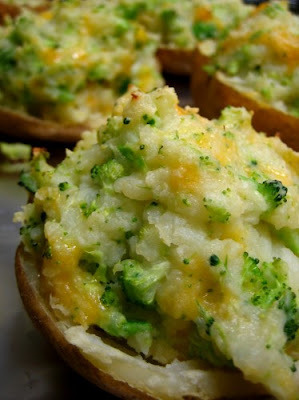 Scoop the filling into the potato skins and bake for 15 to 20 minutes.